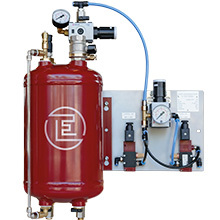 Our supply and dosing systems are designed to harmonize perfectly with all Eckardt lubricators. These range from small integrated dosing devices through to standalone oil supply solutions with filter units and tank heaters. The VB 10 dosing system operates without any pressure. It hangs above the roller lubricator; the oil is supplied to the machine purely through the force of gravity. The capacity of the VB 10 storage container is 10 litres. The dosing system DB 10 uses a pressure vessel with a capacity of 10 litres. This is equipped with a filler ball valve and plastic funnel, a pressure regulator with bleed screw and a safety pressure relief valve. A float switch is fitted to regulate the fill level. There are two dosing valves on the underside. Thanks to automated control of the oil feed rate DOS series dosing systems offer the highest levels of efficiency and flexibility in your lubrication processes – and it does not matter if continuous lubrication is desired or just a single drop is required. The machine cycle time determines the interval at which the lubrication valves open. DOS 40: reservoir and control unit are separate. Also available for squeeze-on lubricators, but without pressure vessel (replacement: VB 10). DOS S: version for sector lubrication; in this case the oil feed for each roller can be programmed separately (via PLC). Other configurations include, amongst others, an extension to facilitate oil supply directly from an oil drum or an option to operate alternating rollers where several oil containers are utilized and it is possible to control the rollers individually. Generally speaking it is possible to use DOS dosing system controllers in combination with spray and spit nozzles. You wish to learn more about the technical characteristics and fields of applications of our dosing solutions? the systems at first hand! Take advantage of our experience and expertise.